Many counterfeit coins of private make are very hard to identify. I have put some of mine on this page. If you know anything about them please let me know. 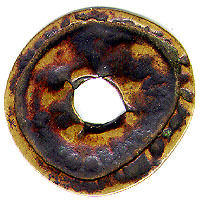 For more strange coins also see the Indonesian Naive Coins page dealing with the shimasen types, and the Vietnam (Annam) Privately Minted Cash page. 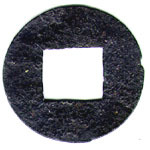 This is a very thin and small coin made of lead or pewter. It is a (J. Shouhei Genpou). Found in Java. This " coin" is not really a private mint coin but I cannot think of an appropriate page so I'll put it here. 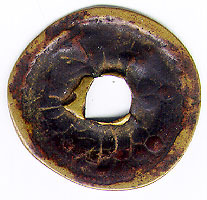 It is a "pipe bowl coin" from Japan. I have made the image large here to show the details but it is 23.5 mm at its widest and the same size as most Kan'ei Tsuuhou. Old fashioned pipes in Japan had small bowls that would frequently break at the neck after much use--tapping the bottom of the bowl on a hard surface to loosen the ashes was common. When the top broke off some people pounded it flat and inserted it into the middle of a string of, say the normal 100, coins so that from the side it looked like a coin and they thereby earned themselves one mon. Alot of work for a penny but as my brother-in- law said, "I can imagine a man with no cash and desperate for drink doing this."